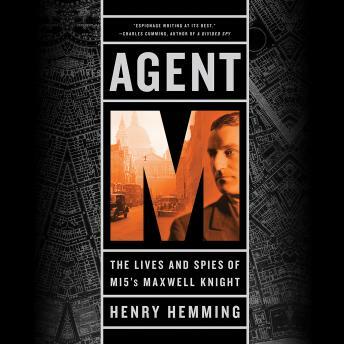 Maxwell Knight was perhaps the greatest spymaster in history, rumored to be the real-life inspiration for the James Bond character 'M.' He did more than anyone in his era to combat the rising threat of fascism in Britain during World War II, in spite of his own history inside this movement. He was also truly eccentric--a thrice-married jazz aficionado who kept a menagerie of exotic pets--and almost totally unqualified for espionage. Yet he had a gift for turning practically anyone into a fearless secret agent. Knight's work revolutionized British intelligence, pioneering the use of female agents, among other accomplishments. In telling Knight's remarkable story, Agent M also reveals for the first time in print the names and stories of some of the men and women recruited by Knight, on behalf of MI5, who were asked to infiltrate the country's most dangerous political organizations. Drawing on a vast array of original sources, Agent M reveals not only the story of one of the world's greatest intelligence operators, but the sacrifices and courage required to confront fascism during a nation's darkest time.